STOKES, Robert Swords (Bobby) 12th April 2019. Suddenly in his 83rd year at his home, Ballynahinch Road, Hillsborough. Dearly beloved husband of Merle, dear brother of Samuel and the late William. Funeral Service in Douglas Funeral Church, 20 Dromore Road, Ballynahinch BT24 8HP on Monday 15th April at 11.00am afterwards to Ballynahinch Congregational graveyard. No flowers please. 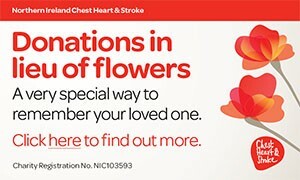 Donations if desired made payable to Chest, Heart and Stroke c/o Douglas Funeral Directors. Will be sadly missed and lovingly remembered by his sorrowing wife, brother, family circle and friends. I am sorry to tell you that Robert Swords (Bobby) STOKES has passed away.